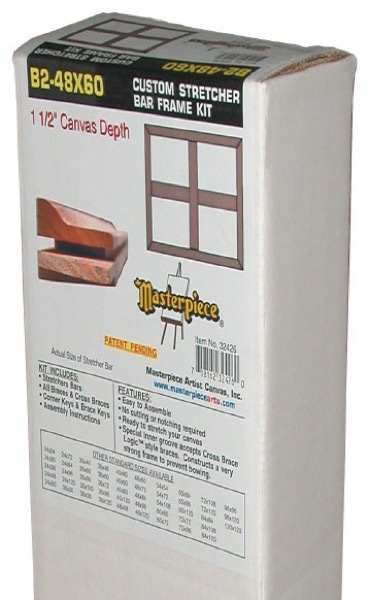 The most elaborate museum class framing system on the market in three depths. Each kit includes all of the Bars, Braces, Cross Braces, Corner Keys, Brace Keys, wood glue, and assembly instructions that enable the artist to construct a fully keyable frame that makes it possible to increase surface tension from the corners, as well as from the middle of the frame, where the tension is needed the most! 1.5" Elite bars are 1½" deep and 2¼" wide. The braces are 3¼" wide. 2.5" 3D Pro bars are 2½" deep and 1¼" wide and have double-grooved corners. The braces are 3¼" wide. 3.5" 3D Pro bars are 3½" deep and 1¼" wide and have double-grooved corners. The braces are 3¼" wide. All bars are made from kiln-dried pine or fir from sustainable forests in the Pacific Northwest, and are all solid pieces of wood with no finger joints.